Sports, sports, sports and a dash of pop culture. When chaos and politics plague the international Twittersphere, America turns to the lighter side of social media. Let’s see what tended to trend this week in USA. Jason Collins made international headlines after becoming the first male pro athlete in a team sport (especially the “big four”) to announce he is gay in North America. But why now? Collins almost came out during the 2011 player lockout, because the disruption of his routine caused him to re-think who he really was and his values. After Boston’s Marathon bombing, Collins realized that things can change in an instant. And that waiting for that perfect moment to announce his coming out to his family, loved ones, fans and the world, was pointless. There’s no time like the present. 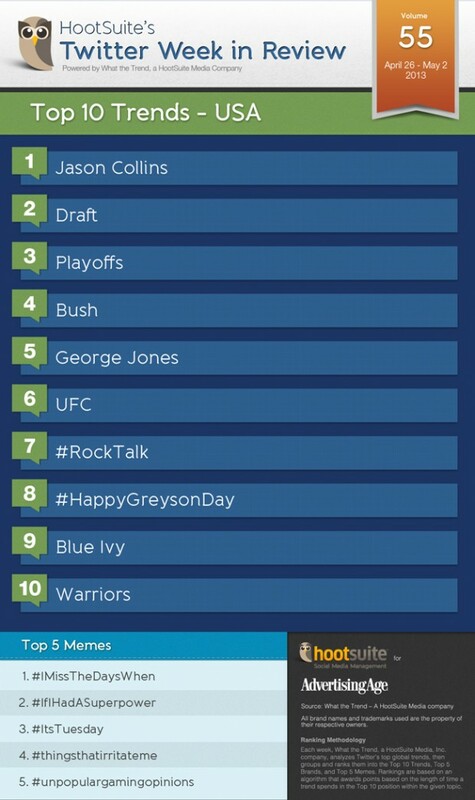 Even in April, football finds a way to trend on Twitter. The 2013 NFL Draft happened last week, and is still trending, as football fans, players and teams are buzzing over the fresh-out-of-college top picks. This year was the 78th annual meeting of National Football League (NFL) franchises to select their newly eligible football players. The top picks for first-round was between Eric Fisher and Luke Joeckel. Now that the dust has settled around past President George W. Bush, his library and museum has opened. This past week marked the grand opening of The George W. Bush Presidential Library and Museum in Dallas. The library opened to the public Wednesday, with the 43rd president greeting 43 schoolchildren. At its dedication the week before, President Obama and past presidents Bill Clinton, Jimmy Carter, George W. and George H.W. Bush spoke kind words at the opening ceremony. Country music fans and stars honored the death of old-timer George Jones at the Grand Ole Opry House in Nashville on Thursday. Jones’ musical reach and influence spanned over five decades of country hits. Many stars spoke and sang at his funeral, and fans took to Facebook and Twitter to pay homage to the late country star. Up next, another sport… UFC (Ultimate Fighting Championship) fans must have been glued to their couches this month as April saw a full schedule of UFC events. FUEL TV had its highest-rated and most-watched month in network’s history as a result. The network telecast four live “UFC Weigh-In and Postfight shows, one live UFC Preliminary show and one thrilling UFC main card,” in just one month – not to mention the filler fights. Young American pop star Greyson Chance celebrated his own success with his fans on April 28th. According to the youngster, two years ago Greyson uploaded his own version of Gaga’s popular hit “Paparazzi” on YouTube and now it has over 50M views and launched his career. Everything Jay-Z and Beyonce touch turns into a trend. The apple of their eyes, baby Blue Ivy has been in the pop culture news this week for a couple of reasons. First, papa Jay-Z’s been reunited her this past week, to support his wife Beyonce as she embarks on the UK leg of her “Mrs Carter Show World Tour.” And secondly, Twitterers have been discussing the baby’s hair-do’s (and don’t’s apparently). See what trended in our International Twitter Trends of the Week.